Where does Dennis Rodman rank among NBA’s greatest defenders? Dennis Rodman entered the Naismith Basketball Hall of Fame in 2011. It’s a deserving honor considering the enormous impact Rodman has had in the sport, especially on defense where he truly (and literally) left his mark. Rodman was an absolute pest on the defensive end, hounding perimeter players and muscling post players with an all-out style that bordered on dirty and calculated. Rodman, nicknamed The Worm, was a unique individual on and off the court. He played to the beat of his own drum, and because he wore his emotions on his biceps he can very difficult to deal with if you don’t allow him his space. But underneath the bleached hair, multiple tattoos, piercings and eccentric personality lies a truly great basketball player who defended his position with boundless energy and passion. Rodman didn’t care about individual scoring. All he cared about was playing hard, defending his turf and, most of all, winning. When he won the first of his two NBA defensive player of the year awards in 1990 he cried at the podium. That’s how much the award meant to him, and also it validated all the hard work he put into his craft. Defense wins championships is an adage that rings true for Rodman as he helped his teams win the NBA title five times during his career. Whether it was against Larry Bird, Michael Jordan, Magic Johnson or Karl Malone, Rodman gave them hell. He guarded the basket as if his lunch money was on the line. 10) ALONZO MOURNING — The former Georgetown Hoya epitomized what a Miami Heat player was in the Pat Riley era – physically and mentally tough. Riley built the Heat image with Zo in mind. Mourning was a two-time defensive player of the year, and he may have won a few more if not for kidney issues. Zo rejected 2,356 shots in his career, but altered thousands more. 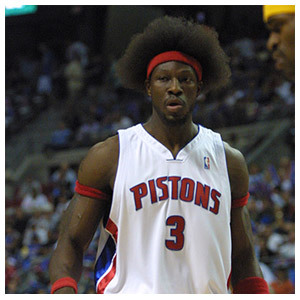 9) BEN WALLACE — The Detroit Pistons captured the NBA title in 2003-04 using a suffocating defense anchored by Big Ben. In the NBA Finals, Wallace (who stands just 6-7, but 6-9 with his massive afro) guarded 7-1 Shaquille O’Neal and held his own without much of a double team and absorbed the beating from the 300-pound Shaq. Wallace is one of just two players in league history to win defensive player of the year four times. 8) SIDNEY MONCRIEF — During the 1980s, there were plenty of top perimeter defenders in the league – such as Michael Cooper, Alvin Robertson and Joe Dumars – but Moncrief was regarded as the best at his position. The former Bucks star was the first to receive the defensive player of the year award, winning it 1982-83 and again in 1983-84. 7) HAKEEM OLAJUWON — Hakeem The Dream is the NBA’s all-time leader in blocked shots, rejecting 3,830 shots during his Hall-of-Fame career. Olajuwon and Michael Jordan are the only two players in league history to win MVP and defensive player of the year in the same season. 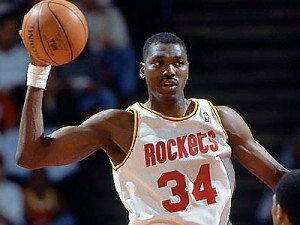 Olajuwon won both in 1993-94, while Jordan pulled off the feat in 1987-88. 6) GARY PAYTON — Nicknamed The Glove for the way he enveloped his opponents, Payton won defensive player of the year in 1996 and amassed 2,445 steals during his 17-year NBA career that included stints in Seattle, Milwaukee, L.A., Boston and Miami. The Glove was also one of the league’s best trash talkers, which oftentimes gave him a huge psychological edge. 5) MICHAEL JORDAN — Jordan is regarded as one of the greatest offensive players in basketball, but his defense was almost as good as his offense. Jordan took pride on being a two-way player, making him one of few all-time great scorers who defended his position as well as anyone in the sport. MJ never backed down from a challenge, and he often volunteered to guard the other team’s best player. 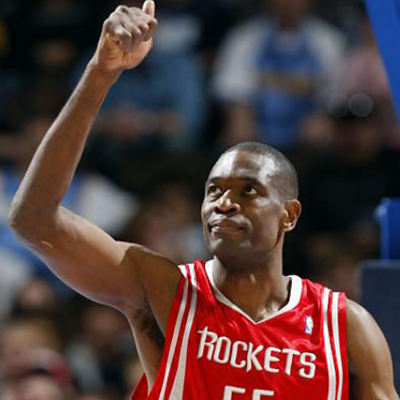 4) DIKEMBE MUTOMBO — At 7-3 and arms as long as a redwood, few tried to challenge Mt. Mutombo at the rim. And those who did often found rejection and was the recipient of an embarrassing finger wag – Mutombo’s signature diss for anyone who dared to challenge him. Mutombo blocked 3,289 shots in his career, second only to Olajuwon. He also won defensive player of the year four times, tied with Wallace for most DPY awards. 3) SCOTTIE PIPPEN — Phil Jackson calls Scottie Pippen one of the smartest defensive players he has ever coach. This is high praise from a man who coached Michael Jordan and Dennis Rodman. Pippen disrupted many offensive plans with his quickness, length and incredible instincts. 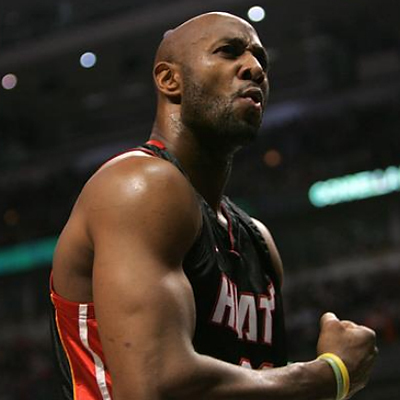 He was named to the NBA’s all-defensive first team eight times and amassed 2,307 steals. During the 1991 NBA Finals, he flipped the series in favor of the Chicago Bulls when he suffocated Magic Johnson in Game 2 and made it extremely difficult for the Lakers to get into their offensive sets. 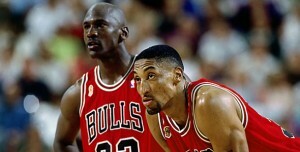 Jordan often got more recognition for his defense, but Pippen was the quarterback of the Bulls’ defense. 2) DENNIS RODMAN — During his Hall-of-Fame acceptance speech, Rodman admitted that all the glitz and glamor is one big act. Underneath the body ink and the fancy outfits is a hard-working man who came from nothing and amounted to something. In the 1996 NBA Finals, then Seattle Sonics coach George Karl said Rodman could have easily been named the MVP of the Bulls-Sonics series, as Karl pointed out that Rodman almost single-handedly won two games for the Bulls in the series with his energy and defense. His former Piston teammate, Dumars, said that Rodman may be flamboyant off the court but on the court he was all business. 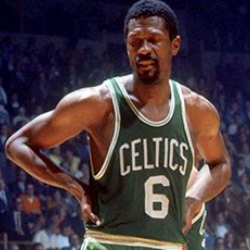 1) BILL RUSSELL — Defense wins championships and nobody won more titles in the NBA than William Felton Russell. The 1960s began and ended with Russell walking off the court a champion. The Boston Celtics dynasty was built on defense, and Russell was front and center. He is second all-time in rebounds with 21,620 and turned the blocked shot into an art form. Blocks weren’t kept during Russell’s playing days, but if they were he would easily be in the top five. What made Russell a great shot-blocker was the way he kept the ball in play, often igniting fast breaks for his teammates. And even though he lost the majority of his one-on-one battles with his nemesis Wilt Chamberlain, Russell never backed away from his greatest challenge and the Celtics almost always came out on top on the scoreboard. Great defensive centers are often compared to Russell, but the five-time NBA MVP was a once-in-a-lifetime player. Joel Huerto is the publisher and editor of OneManFastBreak.net. Follow him on Twitter @onemanfastbreak.